Horley Town progress in the FA Vase with a one goal victory against Selsey. The goal came early on in the game, after only ten minutes, and was scored by Ayden Richards. By both teams’ standards, the quality of football was far from perfect, with the visitors describing their opposition’s performance as “mediocre” and manager Ant Jupp confessing his side was “very poor today”. With a win banked, Horley do however progress into the next round of the FA Vase and are looking forward to the draw tonight (Monday 26th September). Another positive to draw from the game was that Horley kept their first clean sheet of the season across all competitions (excluding their 2-0 mid-September win against Full Time Football). Dorking failed to progress in the Cherry Red Records Premier Cup Challenge after a 2-1 defeat to Worcester Park. The game reached half time goalless, however it did not lack entertainment. Three minutes into the game a finger-tip save, denied Worcester from capitalising. Shots, deflections and successive corners kept the game open and thrilling as Dorking reacted, to what could have been a nightmare start. Dorking took the lead on fifty-three minutes after entering the second half with the momentum built in the first. The lead, however, lasted only eight minutes as Worcester headed home the equaliser in the sixty first. Worcester’s turnaround came ten minutes later, when a rebounded shot beat Nimmo. Running out of steam and ideas, the Chicks could not find their way back and Worcester progress. A devastating late goal in the eighty-forth minute ends Uckfield’s FA Vase run. Uckfield had a strong start to the game, with opportunities across the face of goal which they failed to finish. Despite their efforts, the game reached half time goalless. In attempt to break the deadlock, the Uckers changed their formation in the second half, but still could not find a break through. With extra time and penalties looking to be likely, a late penalty, awarded to the visitors secured them their place in the next round of the competition. Burgess Hill only took home a point from their travels to Grays Athletic, despite capitalising on the stroke of half time. A forty-fifth minute goal scored by Izuchukwu gave the visitors the lead moments before the whistle, however, their one-goal cushion lasted only eleven minutes as Grays found their equaliser shortly after the interval; a superb reaction to the deficit. Neither side managed to find a winning goal, and on reflection, neither deserved to. Manager Ian Chapman comments “It was a poor performance from both teams today… We know we can play better than this”. 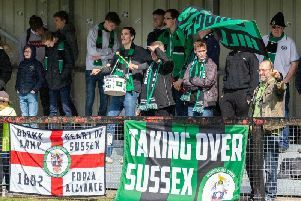 The Hillian’s, however, have gone seven games unbeaten, which is great momentum ahead of their trip to Bognor Regis on Tuesday, who contended for promotion last season, after falling short of top spot by one point, and currently position fourth in the Isthmian Premier Division. Merstham continued their recent fine form with another impressive win against Harrow Borough. Charlie Penny recently returned for a second spell at the club, after his brief spell with National side Woking, and was straight into the action with two goals and an impressive all round display. Goals from Alex Addai, Xavier Vidal and Dan Bennett completed the scoring for the Moatsiders. Addai and Penny had opened the scoring for Merstham, as they went 2-0 up inside twenty-three minutes. Harrow Borough tried to get themselves back into the game, but the home side, who sit 17th in the league, were far too strong on the day. Tony Nwachukwu struck his first goal since returning to the club in the summer to give improving Horsham a deserved point against in-form Walton Casuals this afternoon. The Hornets’ frontman displayed a typical turn of pace and a cool finish to level things up midway through the second half after the visitors had edged ahead through Jack Sammoutis’ fierce drive, five minutes before the break. Dan Summers struck the crossbar for the visitors in the second half, and Scott Kirkwood had a goal controversially ruled out, but although the Hornets finished the game strongly a draw was a fair result on the balance of ninety minutes’ play. Kieran Lavery scored the only goal of the game on the fifty-seventh minute as South Park saw off local rivals Three Bridges 1-0. An even game saw few chances for either side, with both defences working hard to control the game. It was South Park who eventually got the breakthrough with a well worked goal, and held on to seal the victory. The Lingers progress to the next round of the FA Vase after an impressive display against Cobham FC. They started the game well, forcing the home team to make mistakes, which lead to some early chances for the visitors. The rest of the first half was an even battle with both teams probing for an opening. Lingfield took the game to Cobham in the second half, piling on the pressure and creating a succession of chances. Eventually they found a breakthrough, when a cross from Jake Horn was converted by Brett Caiger. From then on in, it was backs against the wall, as Cobham threw players forward. Cobham played with their all up until the final whistle, hitting the crossbar in the final seconds. Lingfield however, held on and progress to the next round. It was a day to forget for Oakwood as they lost 10-0 at home to Shoreham in the second qualifying round of the FA Vase. Shoreham pulled off the display of the round with eight of their ten goals coming in the first half. The game started badly for Oakwood as they conceded in the first minute. Robert O’Toole finding the net with the opening strike of his thirty-two minute hat-trick, and three of seven in the first half. Two more goals from Freddie Barker and Jamie Craddock taking the visitors to double figures, and compounding a miserable afternoon for the Sussex County league side. Sutton United were unable to come back from two quick-fire goals from Eastleigh’s Luke Coulson in their defeat at Ten Acres on Saturday. After a tense, goalless first half, the deadlock was broken shortly after the break when Coulson slotted home after a well-worked move by the hosts on forty-eight minutes. The U’s were undone again just two minutes later, with Coulson beating keeper Ross Worner for the second time in similar fashion. The U’s were back in it with just nine minutes remaining, midfielder Ross Stearn scoring with a brilliant strike from distance to give the visitors hope. Sutton then had a glorious opportunity to draw level on eighty-four minutes from the penalty spot after the ball was handled in the box by an Eastleigh defender. Bedsente Gomis saw his spot kick saved by Eastleigh keeper Ryan, who earned himself a man of the match performance after a string of excellent saves on his debut. Manager Paul Doswell remained upbeat despite the disappointing loss, and was happy with his side’s effort. Speaking about the penalty after the game, he said “listen, Messi misses penalties, it’s just one of those things in football… of course everyone’s disappointed, but that’s why we love football, we have our highs and our lows”. The U’s are 13th in the National League table, and host Guiseley AFC on Saturday. The Anvils let a 2-0 lead slip as they were held in a six goal thriller at struggling Hailsham Town. After being two goals head after thirty minutes, it looked to be a comfortable win for Crawley Down Gatwick, against a side who had lost all eight of their games in the Southern Combination League so far. Hailsham pulled one back just before half time through an Andrew Hazelden strike. The visitors, however, restored their two goal advantage straight after the break. Although it didn’t last too long; the hosts found themselves once more back in the game with a goal on sixty minutes. Eleven minutes later, Sam Divall levelled the game, securing Hailsham’s first point of the season. The Anvils are very familiar with high scoring games and have already scored twenty-two goals this season. They have however, conceded a total of twenty-five; which in nine games, gives them an average of five goals every game! Crawley Down Gatwick play Lancing on Tuesday night, which is going by their season so far, promises to be goal thrilling! Dorking Wanderers handed Hastings United their first defeat of the season and now sit second in the Ryman League South table. Wanderers withstood early pressure from the visitors and took the lead on twenty-four minutes through Billy Medlock, scoring against his former club. Hastings were level in the second half when midfielder Simon Johnson scored five minutes after the interval. Wanderers secured all three points in the seventy-second minute when Rob Sheridan coolly slotted under the Hastings keeper from a tight angle. The Wanderers are just three points behind league leaders Tooting & Mitcham United with two games in hand, and host fellow promotion chasers Carshalton Athletic on Tuesday. Chipstead picked up their fifth defeat of the season, after narrowly losing to Molesey. It was a difficult afternoon for the Chips, playing on a dry, bumpy pitch prevented players such as Raheem Sterling-Parker, Erivaldo Felix and Chris O’Flaherty from employing the fast, flowing football that manager Anthony Williams likes them to play. The Chips had most of the first half chances, Sterling-Parker unable to find the back of the net after couple of good chances, and O’Flaherty’s free kick found the side netting. The hosts came closest to opening the score line, after hitting the underside of the bar. Ceesay into the far corner of the net. Chipstead rang in the changes in search for an equaliser, and continued to create chances until time eventually ran out for them. They travel to bottom of the league Godalming Town on Tuesday, hoping for a change in fortune and a move up from twentieth in the division. Crawley Town clinched back to back League wins for the first time since October 2015 in an exciting encounter at the Globe Arena which saw four goals in the last five minutes. The Reds dominated the possession and chances throughout the game but were unable to find a way through the Morecambe defence. This prompted manager, Dermot Drummy, to make a change, introducing on-loan Mansfield striker, Adi Yussuf, after sixty-nine minutes. His impact was immediate, putting the visitors ahead two minutes after coming on, slotting in Aliu Djalo’s deflected shot under the keeper. Yussuf then turned prover, setting up James Collins on eight-five minutes for his fifth goal of the season. It looked to be game over after that, but Morecambe were not done yet, and halved the deficit on eighty-nine minutes through Michael Rose’s low curling free kick. The visitors reacted instantly, and restored their two goal lead on the announcement of added time; Adi Yussuf providing another assist from the right for Jimmy Smith, who fired his low shot in the far bottom corner. Again, it looked to be game over, but again the Shrimps fought back through Cole Stockton’s excellent volley on the turn, the best finish of the afternoon. It was too little, too late, for the hosts however, and Crawley held on to take home all three points and move up to eleventh position in the League Two table.